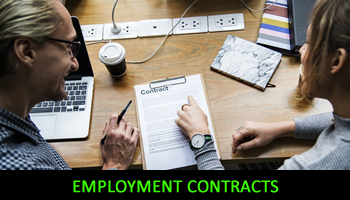 All employers are legally required to provide all employees with a written statement of their terms and conditions of employment within the first eight weeks from their date of employment, and to confirm any future changes within one month of that change taking effect. In addition, the law dictates the minimum details that must be provided, however it is good practice to to go beyond this minimum requirement to ensure that the employee is aware of what is required of them and what will be provided by you the employer. I will provide you with an appropriate set of up to date and legally compliant contracts to cover all your different types of of employees. To discuss any issues around the review, updating or creation of employment contracts please give me a call on 07850 208701 or email me on rcwhrsolutions@talktalk.net noting your contact telephone number and I will come back to you as soon as I possibly can.